Continuing the purge of my old writing files after a hiatus to paint the master bath. Not only am I finding stories I never published (no surprise there, not every story is a winner), I’m finding stories and articles I’d forgotten I’d written. 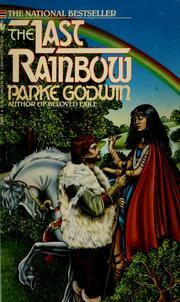 One of which was a fairly detailed review of Parke Godwin’s The Last Rainbow. I was reviewing for the long gone Fantasy Review at the time, and as I was going through my old file I found a letter from the editor telling me they already had a review of the book, so my review was never published and I’m including it here. There are a couple of spoilers, for those among you who believe that what happens in a book is what the book is really about, so fair warning. Parke Godwin’s The Last Rainbow is subtitled “A Novel of Saint Patrick” and that’s certainly true—in the same sense that Firelord was about King Arthur and Beloved Exile, Guenivere. As in it’s true so far as it goes, but it doesn’t go nearly far enough. Novels about legendary figures are nothing new—the bare bones of fact and myth always beg for the flesh of the storyteller’s art, but to say that the vein has been mined before is to completely miss the point. What sets our best writers apart is not chosen genre, social consciousness, or even prose style. It is their ability to look at a subject, any subject, from their own unique perspective and let the rest of us see what they see. Communication is the heart and soul of any good story. Anything less is just ‘connect the dots’ and word games. T.H. White used “The Matter of Britain” in his The Once and Future King to reflect his own society, and if the images in his mirror are cloaked in fancy they’re never hidden. John Gardner took the Anglo-Saxon epic Beowulf and turned it on its head, telling the story from the monster’s point of view in the masterful Grendel, and suddenly we’ll never again be quite so righteously complacent in the hero’s triumph. Agree or not, we will look again, and wonder. All of which is a roundabout way to point out that Godwin works a kindred magic in The Last Rainbow. He takes the stone statue life of Saint Patrick, and with a superb artist’s eye, patiently chips away the gilt of time and dogma to reveal the living flesh beneath. Instead, Patricius goes to preach in the Pictish tribes in the north. The Venicones are one tribe that has seen missionaries before, but nothing like Patricius. His zeal and passion for condemning their gods and customs makes him a problem, but being practical men they arrive at a practical solution—they break Patricius’ legs and leave him on a hill to die. Fortunately for the priest, the Venicones are not the only people around Hadrian’s wall. Patricius is rescued by the Salmon-fhain, a wondering group of the Prydn. Child-like in stature and barely tolerated by the other inhabitants, they’ve learned to make do with little, to move silently, and craft small bows and arrows that seldom miss. The picts call them by another name—fairie. Am I the teacher or the taught? “…He saw the huddle of them paused together; then one who rode some way back toward his hill. Don’t, Dorelei. Understand it. We have had such beauty. Miracles. And this is one of them. I have found my own treasure. Extensive quotes have been justly called the crutch of the lazy reviewer, but some books should be allowed to speak for themselves. Godwin’s meticulous research, compassion, and sharp eye for detail interweave seamlessly into a book that is at once entertaining, and in the very best sense of the word, human. The Last Rainbow reads easily and quickly, as only precise, lucid prose can, but do yourself a favor—take your time. This entry was posted in Folklore, legends, novel, Reviews and tagged Fantasy Review, Parke Godwin, The Last Rainbow by ogresan. Bookmark the permalink.